Ethernet switch, hub and splitter all are networking devices that are designed to connect computers, other network devices, or even other networks. However, each of them has its special merits and drawbacks. Then, what on earth are they and what’s the difference between them? In this article, we will explore Ethernet switch vs hub vs splitter. Ethernet Switch vs Hub vs Splitter: What Are They? Usually, an Ethernet switch works at the data link layer (layer 2) or the network layer (layer 3) of the OSI (Open Systems Interconnection) model. Therefore, it can support multiple packet protocols. As a multi-port network bridge, the Ethernet switch provides various ports for subnets to connect computers, cameras, printers, etc. Through these ports, the data packets can be sent and received within a LAN. A hub commonly operates at the physical layer or layer 1 of the OSI model. It consists of different ports used to connect segments of a LAN. When a data packet arrives at one port, it is copied to other ports that all packets can be seen by all segments of the LAN. The splitter is an integrated optical power distribution device. It is one of the commonly used passive optical devices. And it is used to split a light beam into two or more light beams and couple them to the branch distribution without external power. There is a saying, hubs are yesterday news and splitters are basically unnecessary. An Ethernet switch is probably what you want. Is that true? Here we will make a comparison between them. Ethernet switch and hub have similar roles in the network. To understand the difference between Ethernet switch and hub, we’d better get to know frames first. The frames act as a central connection that carries data. And these frames can be received, amplified and then transmitted on to the destination port. The main difference between Ethernet switch and hub is the way that frames are being sent. The hub can not examine the data it receives or sends. Therefore, just as mentioned above, when a frame arrives at one port, other ports will copy the data to ensure the data can be delivered to its destination. With this feature, a hub can create more connection points, which extends the network. However, this may cause a lot of traffic. What’s more, the bandwidth of the hub needs to be shared with its ports, which slows down the network. So the hub is usually used for the small-sized home network. Ethernet switch can keep the record of the MAC (Media Access Control) addresses of all the devices connected to it. Therefore, when a frame is received, a switch knows which port it will be sent to. Moreover, unlike the hub, the switch allocates the same and full bandwidth to each of its ports. All in all, the Ethernet switch is regarded as a better choice than the hub. Instead of using the hub, you can use 8 port switch for small-sized family. 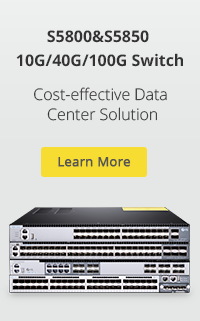 And you also can use 1GB switch or other Ethernet switches with larger capacity for busy networks. 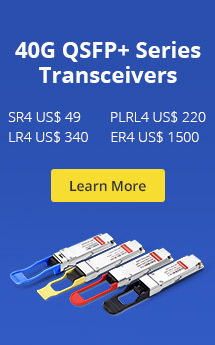 As mentioned above, splitter plays an important role in the passive optical network. It means that the splitter doesn’t need power input to split a single Ethernet connection into two connections. However, it needs to be used in pairs. What’s more, the splitter is based on 100BASE-T standard, which deals with network traffic at the rate of 100Mbps. So is it not suitable for long transmission or large data center. In terms of Ethernet switch, it usually needs a power input. So it can divide an Ethernet signal into multiple signals and these signals can operate simultaneously to achieve a fairly long distance. Besides, Ethernet switch is a high speed networking device with multiple ports. You can use one port to connect the switch to the router and the rest to connect other devices. As a result, different devices such as computers, video game consoles, and printers can be connected by the switch and still work fast in a system. If you want to connect additional computers or a switch in the same room or nearby rooms, you can choose the splitter. While the Ethernet switch is more widely used in building, campus and so on. 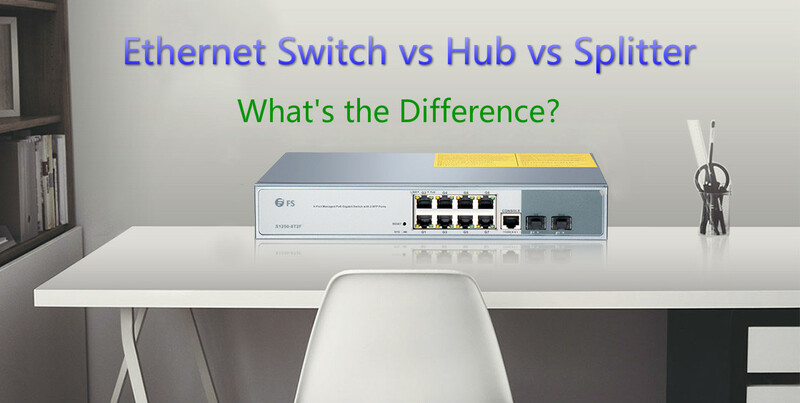 As for Ethernet switch vs hub vs splitter, we know they are used for different purposes. The best Ethernet device is the one that suits your needs most. So you can choose to buy switch, hub or splitter according to your demands. If you want to know more information such as network solution, 8 port switch price or 24 port switch price, welcome to visit FS.COM. This entry was posted in Gigabit Ethernet and tagged 1gb switch, best ethernet switch, Ethernet switch vs hub vs splitter. Bookmark the permalink.